The ImmersionRP Add On originally written by Seagale, continued by Shannae. 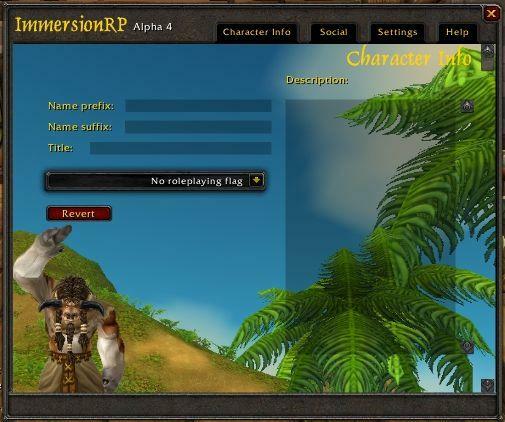 ImmersionRP is a FlagRSP2 and MyRolePlay compatible Add On, which provides the user with the ability to supply additional descriptive text about their character and to set an "RP Status" such as Roleplayer, In Character, and Looking For Contact. ImmersionRP keeps to a strict design philosophy of intuitive interface design and minimal complication. This is a small bugfix release, with a client version upgrade. Naes random tip for this build: Don't want the infobox popping up in the middle of your raid? Right click your unit frame, go to ImmersionRP, and Disable ImmersionRP Temporarily. Next Up: More code optimization, peer-to-peer description transmission, and improved tooltip handling. Currently Annoying Me: How to not cause errors with the drop down menu to set a focus, before Blizzard fixes the client so this works the way they tell us it should. I accept (but do not respond to) direct emails sent to Shannae dot Darkehart at gmail dot com. Hey, no need to kick yourself! You did a good job supporting IRP. In case anyone is interested. It's not perfect, but mostly functional. Best I could do without having an active WoW subscription. Please post any error messages, bugs, feature requests, etc on the Curse page. It's unlikely that I'll fix/change/add anything as I'm not currently playing WoW, but who knows? I've just returned from a hiatus myself, hoping that my many and varied concerns with Cataclysm will have been or are about to be addressed. Thus far, it seems like they are. This page will get updated shortly while we get coordinated again. In case anyone is wondering, yes, having seen the fixes in Seagales update, I am thoroughly kicking myself for not figuring it out. Well...its looks like the projekt is dead? Mhm...will anything happen? I'm still wating for the bast flag addon. I know that feeilng well! If you’d like any help, please don’t hesitate to ask. See email. I would note, also, that I've set aside the entirety of today just for this project. So I'll be around and posting. I ESPECIALLY need a hand bug testing. The intention is to support both the FlagRSP and MS protocols. A significant amount of the time it's taken to make this work is the difficulty in achieving that goal, while maintaining a level of performance close to if not better than what IRP had before. That said, I do have one question: will the new IRP be compatible with the new MRP? I've never been a fan of MRP, but I love how little memory it takes up now. The MarySue Protocol is far superior to the old channel-based method, as much as people complain about it splitting the community. If I could switch to IRP, when it's ready, and still have MRP compatibility, I'd be a happy camper. Beginning to think we're not getting an upgrade after-all.